3. 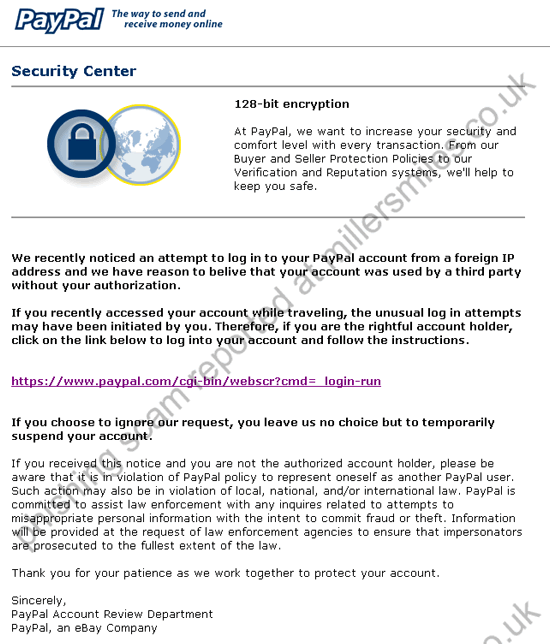 URL of spoof website disguised as " https://www.paypal.com/cgi-bin/webscr?cmd=_login-run " by an image in the body of the email - a technique used to get past spam filters! 4. Real URL looks nothing like PayPal! 5. Website traced to Madrid, Spain.
" We recently noticed an attempt to log in to your PayPal account from a foreign IP address and we have reason to belive that your account was used by a third party without your authorization."